Special teams played a prominent role in the Blackhawks’ performance in Edmonton on Monday night. Unlike some other games against the Oilers over the last few years, this time Chicago benefited from a couple big plays. Jonathan Toews opened the scoring with a short-handed tally 5:14 into the opening period. The Oilers had five forwards on the ice, and Nail Yakupov did an outstanding job of watching Toews blow past him. Chicago’s captain embarrassed Edmonton starter Devan Dubnyk with a slick move in front of the net and scored for the 12th time on the season. That goal tied Toews with Patrick Kane for the team lead, but that would be short-lived. 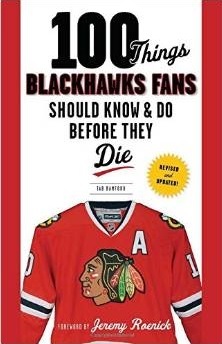 Less than three minutes after Toews’ goal, Kane scored a power play goal to give the Blackhawks a 2-0 lead. Duncan Keith was credited with the secondary assist on both of the first period goals, making him the leader among all NHL defensemen this season with 19 helpers to date. The goal extended Kane’s point streak to 11 straight games. In the second period, Corey Potter tapped a rebound into his own net 88 seconds in to make the score 3-0 Hawks. Johnny Oduya, who had another strong performance, was credited with his second goal of the season. Oduya also accumulated four blocked shots, the fourth of which stung him during a third period penalty kill. He did not miss a shift, however. 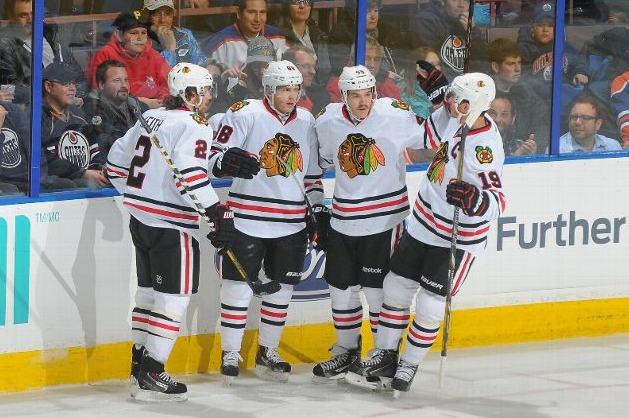 Andrew Shaw added to the scoring for Chicago with his sixth goal of the season off a pretty setup from Jeremy Morin. That goal would be enough for Edmonton to make a change in net, and Ilya Bryzgalov came in to make his Oilers debut less than six minutes into the second period. Shaw added his seventh of the season late in the third period to close the books on a dominant 5-1 Chicago victory. Corey Crawford wasn’t tested much in the first 4o minutes, but stood tall on a number of decent scoring chances to earn another victory. Crawford kept 24 of 25 Edmonton shots out of the net. Ten different Blackhawks registered a point in the game, led by Shaw’s three points – two goals and the primary assist on Kane’s goal – and Keith’s two assists. Shaw won only one of eight faceoffs, but was also credited with one hit and one takeaway in the game. Brandon Bollig was credited with three hits and one assist in a game that wasn’t very physical until David Perron decided to throw a few late hits with the game out of reach late in the third. Kris Versteeg led the Hawks with two takeaways. The Hawks successfully killed all three Edmonton power plays on the night, and scored one goal on their four advantages. Part of the good penalty kill performance was the re-introduction of Michal Handzus in the lineup. The veteran center skated 12:57 in the game – 2:05 of which came short-handed – and won five of nine faceoffs in his first action since late October. Marian Hossa is expected to join the Blackhawks in Calgary on Wednesday. The Hawks are 4-1-0 and have outscored their opponents 19-11 since they were blown out in Nashville, and five of those 11 goals against came in their loss to the Avs. Nice to see the other team bitchin for once about a fast whistle. does that mean 11 sits again??? BUT you can’t split up 10/19/81- way to dominant thus far… Soooooo!!! where does Q skate 26??? Of course-26 surprised everyone last year!!! Let’s see what he can do for an encore!!! I will add that the 2nd line w 26 was probably the least effective line of the nite! Toews’ shortie was huge to set the tone early. Not that the Oilers didn’t have a few quatlity chances eary, and not that there wasn’t some edge of seat sitting after they scored to make it 4-1 because recent history has shown that the Oilers’ speed and counter attack has been effective against the Hawks. But, ending the 1st period 2-0 and then going up 4-0 made this one a whole lot easier on the nerves than what I expected. Yep, all in all the Hawks played a pretty solid game. Didn’t give them much in terms and when they did get a sniff – “Leaping Crawford” jumped on it and snuffed it out. Keith continues to look Norris-y. He is now 4th in the league in assists with 19, behind only Malkin, Thornton and Backstrom. Among d-man scoring, his 20 points is tied with Subban for 3rd place behind Karlsson (24) and Buff (21). On to Calgary with Hossa hopefully rejoining and let’s keep this train-a-runnin. People can rip Handzus all they want. All that matters is that Q likes him, his teammates really like him and he is a positive contributor on the ice. He needs to be in the mix for 2/3 rds of the games if healthy. I thought Morin had a strong game too. Much better than BB as a wing and better than Bollig, who can not seem to make a pass. I think that Morin is also nasty enough to replace Bollig. Maybe with the return of 81 Q will put 11/16/28 as his 4th line. Anyone see that hit by Johns for ND vs. Mass/L… OMG- Olsen was completely expendable!!!! Hope they sign that SOB!!! 11 is a better skater than I thought… His “real” flaws ( I am trying to get into Q’s head here) are- he floats a bit out of D-Zone (like Kaner can/does- but 88 is world class skater- so he gets away with it)… and 11 is a bit selfish in the O zone, and tries to skate/carry the puck up a little to much! Pirri has gotten rid of habits 2,3 and has learned to get it to 88- so he looks much better. OR- perhaps this is SB/Q’s way of “Cap-Control”- limiting/restraining 11 from bigger #’s/ and teaching him the importance of complete play… more evidence of this- 11 should be on that 2nd PP unit… BUT- the PP is working now… and the less 11 scores- the cheaper he will be next year! I will wait for Rufus’s anti-11 rant now… Luv ya Rufus!!! Wall- I’ve watched that hit by Johns like 100 times and I giggle like a mad man every time I see it. One of the fiercest open ice checks I’ve even seen. The poor guy he hit knew he was going to get rag dolled. Handzus. Woof. The lone goal by Edmonton was from his man that he couldn’t move fast enough to cover. Sure, it’s his first game back, we can allow for a mistake or two, but honestly Handzus has no business on a wing. If he isn’t going to play with Hossa, he needs to be hidden on the 4th line and you move Kruger to a wing. I appreciate what he brings to the team, but I think his best contributions will be in the playoffs with the proper matchup. Jeremy Morin is faster than I thought he was. Of course, he could only 9 minutes of ice time in a blow out even though he had one of the better Corsi ratings on the team. Whatever. Crawford lost his net a lot, I thought he was pretty lucky to only give up one goal. I really hope Raanta gets the start on Wednesday and finishes the game. If not I will weep for CC. Morin is going back to Rockford tomorrow anyway, so it doesn’t really matter… but that fourth line needs fixing. Sure, they haven’t given up a ton of goals in the last few games (as opposed to the couple of games where they got shelled), but they are giving up a lot of opportunities. Ben Smith has been really good (like really good), but he isn’t Frolik. I would really like to see what the 4th line can do with a different wing than Bollig, but that isn’t going to happen. Looking for a clip of the Johns hit on youtube. Not being successful. Help please. Lost the other link I had. JS- rag doll is perfect… the poor kid’s limp legs/skates flying above his head- never seen any CLEAN hit like it!!! Wall, I agree Morin can be a puck hog, but I don’t think he is selfish. He could have easily (and instinctively) shot that puck instead of sliding it over to Shaw. Morin is adjusting to the speed of the NHL game. He will come along quickly as his playing time accumulates. In that respect he is a lot like Smith. I am an advocate for both of them. For me, Bollig has to be the odd man out. I love Zues, but he should take a support role and let the kids play…….That said, JS you are probably right, Morin will be sent down. While I think a case can be made for Hjalmarsson being the best defensive d-man, I think Keith’s scoring (albeit only 1 goal) pushes him into the Norris conversation where Hjalmarsson will likely never go because of the emphasis the Norris voters place on scoring. Whether you or I agree that the Norris should place so heavy a weight on offensive for a supposed defensive award is irrelevent because that’s just the way it is. But, Norris Trophy aside, I don’t necessarily agree that Hjammer has been the Hawks’ best d-men. I think early in the season I would have shared that opinion, but over the last few weeks I think Keith has really picked up his game and been not only the best d-man on the Hawks but possibly the best d-man in the league, offense aside. I complain about his shot and all the hit shinpads and missed nets, but pretty much every other aspect of his game is elite level. and was speaking more in terms of all the games thus far. Great game by the Hawks. It’s nice when the minutes are being spread out over all four lines. I noticed that Versteeg’s ice time was less than Brookbank was he benched by Q for any mistakes? I’m so glad they are winning these games against Vancouver and Edmonton so i don’t have to listen to the loud mouth know it all Western fans. I’d like to give Crow some credit for last nights game and the 1st quarter of the season. I think he has played extremely well. He leads the league in both Wins and Minutes and has a solid GAA and SV%. He has had some clunkers, but every NHL goalie has a bad game. I think Crow has responded very well with his new paper and I am excited to have him locked up long term!